Every time I wonder about finding purpose and what direction I should take it, I return to the past. I take the time to rediscover the things that I found joyful in my life. With this intention, I choose to expand my life into a new direction and purpose. In other words, most of the things you have done in the past will have taught you skills that you can now spin into something new and enriching. In other words, the joy and tears of the past are key to finding purpose in life. When you are on the right track to finding purpose – the Universe will move mountains to help you on your path. Moreover, continuing to move toward your purpose will feed your ideas and creativity. In particular, the only way to find your own purpose is to try on different things to see if they fit. Some will take work, practice and knowledge and others will just be for the experience. In other words, follow your imagination and see where it takes you. It is important to realize that we are all unique in what we desire to experience in our lifetime. Live it now rather than later. Choose your experiences, and if they feel right keep going! When they feel awkward, keep going until the newness wears off before moving on. Love it or leave it. That simple. With this in mind, you must recognize that sometimes you are just not ready yet. Consequently, at other times it is exactly the right time. 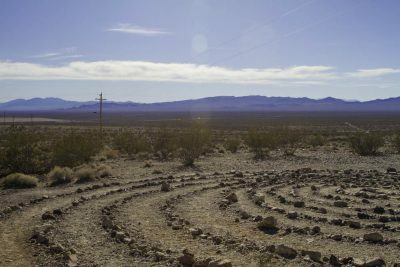 This labyrinth can be found in the ghost town of Rhyolite, Nevada which consequently has an artists residency program. As a result it is filled with some lovely artistic surprises. For the best results with this affirmation you also learn more about how to use them…. read more here. Looking for another affirmation today? Try visiting our Affirmation Generator page because it has access our data base of over 750 affirmations. Try asking the Universe to pick out another perfect affirmation for you and see what happens! Dream It, Affirm It, Believe It, Achieve It!